Childhood toys, whimsical sounds and visuals, and effortless singing are brought together by Alexa Dexa, who incorporates these unconventional components together to bring a whole new experience for her audiences. 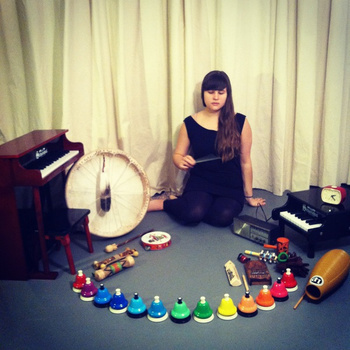 As an artist in every sense of the word, Alexa has concocted her very own genre of performance called “toychestral electronic pop” that involves the sounds of desk bells, a toy piano, and self-made electronic beats complimenting her self-written songs. This quirky performer engages all the senses in her performances and brings the concept of fantasy to life. Of course, the most unexpected treats are the toys and child-like art installations done by Alexa herself, enhancing what she calls “sound worlds”. These worlds are inspired by the artist’s personality and aesthetics that appeal to her. She says the intent of combining her songs with her visual work is “to transport the audience into a bit of fantasy and to allow access to my music through a different avenue of perception.” The primary colors of the toys, graphic illustrative backdrops, and mellow tunes haul you into a serene and friendly environment all assembled from the mind of Alexa. Her inventive creativity is what makes Alexa stand out in the areas of music, performance, and visual art as she blends these boundaries so seamlessly. Alexa will be performing her one-of-a-kind show Monday August 18th at 7PM, after the screening of “Frank” at the Cinema Arts Centre presented by SPARKBOOM™. RSVP on Facebook here.